The Trump administration this week “revealed its most detailed list of objectives to date” for overhauling the Nort h American Free Trade Agreement, said Alan Rappeport in The New York Times. In a 17-page document sent to Congress, the White House said it would prioritize reducing the U.S. trade deficit with Canada and Mexico when formal renegotiation talks for the 23-year-old pact begin in August. 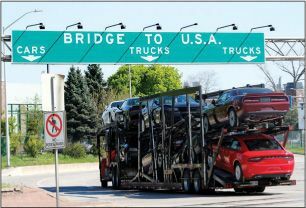 Officials said that a revamped NAFTA must include “provisions to eliminate unfair subsidies” and more authority to crack down on cheap imports coming into the U.S.
“The original augmented-reality spectacles are back,” said Marco della Cava in USA Today. Alphabet unveiled the newest iteration of Google Glass this week: Glass Enterprise, which reimagines the wearable face computer as a work tool. The company has quietly spent the past few years partnering with dozens of businesses to explore possibilities for the wearable device. DHL package sorters, for instance, “have increased their efficiency by 15 percent by getting information projected into their line of sight.” Google shelved the consumer version of Glass in 2015 after a rocky rollout sparked privacy and safety concerns. Wells Fargo is selling off businesses as the bank tries to restore its “reputation for simplicity and prudence” in the wake of its fraudulentaccounts scandal, said Alistair Gray in the Financial Times. In recent weeks, the bank has reached deals to sell its share-registration unit to London-based Equiniti for $227 million, and its commercial insurance business to New York–based USI Insurance Services for an undisclosed sum. Executives say that more deals are probably in store for the U.S.’s third-largest bank, which operates about 90 different businesses.